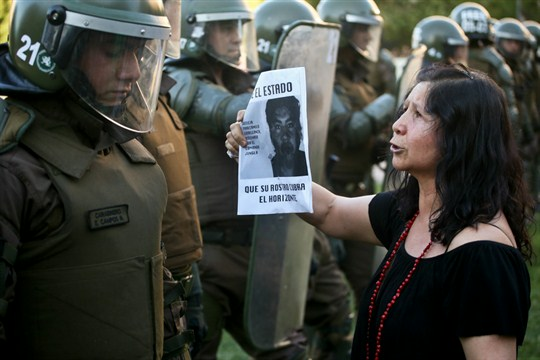 A woman shows a picture of Mapuche indigenous man Camilo Catrillanca, who was killed by security forces, to riot police during a protest in Santiago, Chile, Nov. 19, 2018 (AP photo by Esteban Felix). President Sebastian Pinera’s administration in Chile is facing heavy criticism for its treatment of the country’s marginalized indigenous groups after security forces killed a young indigenous man in the southern Araucania region last month. Camilo Catrillanca, a 24-year-old Mapuche, was fatally shot on Nov. 14 by members of a heavily armed counterterrorism squad known as the “Jungle Commandos.” Four soldiers have been arrested in connection with the incident, which has prompted public protests across the country. In an interview with WPR, Jorge Contesse, a professor of international human rights law at Rutgers University, discusses the history of the Chilean government’s policies toward the Mapuche and other indigenous groups and explains why, in his view, a fundamental change of perspective is needed to address the issue.